The dual channel DIN Rail and Termination Boards Digital Relay Output models D5244D is loop powered digital output modules enabling a Safe Area loop voltage signal, to control a device in Hazardous Area, providing 2 port isolation (input/output). Outputs are galvanically isolated. Typical applications include switching of Hazardous Area circuits, changing of polarities and sounder tones, calibrating of strain gauge bridges, resetting of field devices, testing of fire detectors. 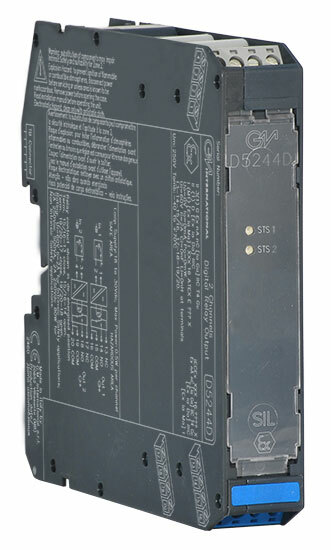 Each output channel provides a SPDT relay, with two contacts defined NO (Normally Open) and NC (Normally Close) when the output relay is de-energized. Considering each channel NE (Normally Energized), the output relay is energized, so that NO contact is closed (useful for NE loads or Hazardous Area circuits) and NC contact is open (useful for ND loads or Hazardous Area circuits). The safe state is reached when the channel and the output relay are de-energized, so that NO contact is open (deenergizing loads or Hazardous Area circuits) and NC contact is closed (energizing loads or Hazardous Area circuits). • Two port isolation, Input/Output/Supply. 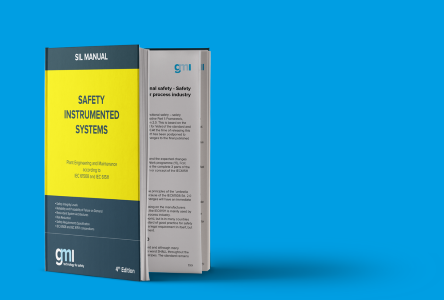 • Simplified installation using standard DIN Rail and plug-in terminal blocks or customized Termination Boards.